Melbourne Band 310 – Short of a time warp, the closest you can get to experiencing the power and shock of ‘60s rock music is to see Melbourne Band 310 live in action. Melbourne Band 310 have been around for over four years recreating that ‘60s excitement and rawness that often gets lost with cover bands. Listen to one members guitar solo or anothers drum roll and know that the ‘60s were about experimentation and risk taking, not just good pop melodies. 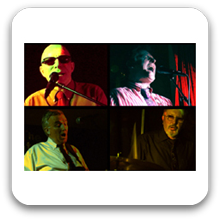 With incredible vocals and superb guitar work, a rhythm section, drummer, bass plus the punk energy of another member on guitar and keys, Melbourne Band 310 faithfully produce the sounds of the ‘60s, just like the record, but with real spirit, dry humour and a passion that you will remember. Our mission statement is: NO STANDING, JUST DANCING! They are simply the best 60’s band in Melbourne, bar none!.